Disclaimer: I was given products in this post for the purpose of review. I was in no way paid to write this post, all opinions are my own. For several years sleep was a thing of the past. With two little boys waking up at all different times I hardly got 3 straight hours of sleep let alone the suggest 7-10. Now my boys are bigger and in their own beds! I forgot just how amazing it was not to wake up with little feet jammed into my side. I do love my sleep and I want to make sure I am getting a good nights sleep. 1) I keep my room cool, when I'm over heated I wake up uncomfortable. 2) No sound. I make sure everything (except my fan) is turned off. 3) No lights on in the entire house, I wont fib I even turn my alarm clock backwards so the red numbers don't bother me. 4) No caffeine or sugar for at least 2 hours before bed. 5) And finally I make my personal space relaxing. Well I use to have no way, now thanks to Beddit I do!! 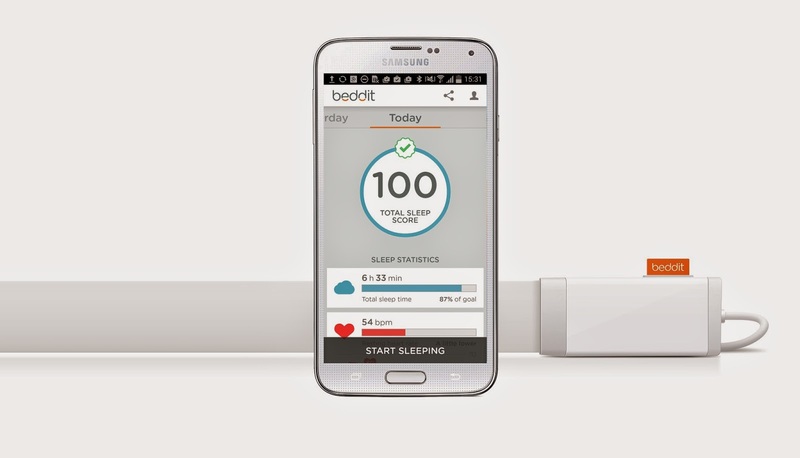 Beddit is one of the pioneers in sleep technology. Originally designed in Finland, this revolutionary monitor is taking hold of the US market, helping improve the quality of sleep for thousands. Sleep affects our day to day lives. A better, more restful night’s sleep can improve your work efficiency, reduces stress, boosts your workouts, and even enhances your relationships. • No wearables needed! You won’t even notice it in your bed. • Easy to use and accurate Beddit is easy to setup and links through the Beddit app available on your smartphone or tablet. Okay so that was a lot of information, let me explain to you my experience so you can see how much I enjoyed using my Beddit device. Set up was super easy. All I had to do was place the super thin Beddit sensor under my sheet onto of my mattress. I love that I couldn't feel it, a huge plus that it was on the bed and not me! Next I had to launch the free app. Again this was easy, anyone whom has downloaded an app before knows that isn't much work put into it. So far all I had to do was make my bed and set up an app.... Yes it was that easy. I had to sleep, lol. As I slept the Beddit app measured my breathing rhythm, heart rate, motion and snoring. All of which were used to measure my sleep quality. I was able to see all my sleep data and I was even giving personalized tips! For someone whom loves sleep as much as I do this was amazing. I was pretty impressed with how easily it read even the tiniest of moments. Now it was great having all this information, but I had to share with my family and friends. So when I was giving the chance to host a "Let Mom Sleep" party I knew my guest were going to be as excited as I was about this new sleep device. I invited several people over and not only showed them how easy it was to set up, but also how in depth the results were. Everyone was pretty impressed and my dad who suffers for non-stop snoring can't wait to try Beddit for himself. And what would a "Let mom Sleep" party be with out some part favors! Thanks to dearfoams my guest were able to party and relax at the same time! Known for consistently delivering trend-right products that offer the ultimate in comfort, Dearfoams is the world's best-known name in slippers. Dearfoams lineage can be traced back to the original foam-cushioned slipper pioneered by the company in 1947. More than 60 years and a billion pairs later, people still love the exceptional comfort, style and quality provided by every pair of Dearfoams. I was excited to see Dearfoams in this party kit. I am no stranger to their ultimate comfort! I own several pairs already and have both my mom and sister addicted. After the party my hubby can't stop wearing his either. This momma loves her sleep and thanks to Beddit and Dearfoams I am now enjoying it a bit more! Mother's Day is just around the corner. Why not give mom a gift that keeps giving!